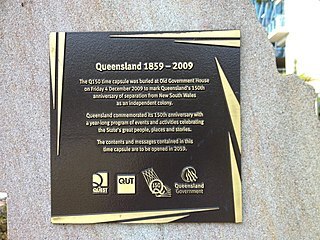 The main article for this category is List of Queensland's 150 Icons. Pages in category "Q150 Icons"
A lamington is an Australian cake, made from squares of butter cake or sponge cake coated in an outer layer of chocolate sauce and rolled in desiccated coconut. The thin mixture is absorbed into the outside of the sponge cake and left to set, giving the cake a distinctive texture. A common variation has a layer of cream or strawberry jam between two lamington halves. Undara Volcanic is a national park in North Queensland, Australia. It is notable for its lava tubes and gem fossicking. Minerals found there include topaz, moonstone, peridot, aquamarine, garnet, quartz and gold. The park contains the remains of the Earth’s longest flow of lava originating from a single volcanic crater.. The lava flow is about 160 km long. The park is remote, and accessible from the regional centres of Townsville or Cairns. Noosa Heads is a town and suburb of the Shire of Noosa on the Sunshine Coast, Queensland, Australia. It is located approximately 136 kilometres (85 mi) north of Brisbane, the state's capital. The Ekka is the annual agricultural show of Queensland, Australia. Its formal title is the Royal Queensland Show, and it is held at the Brisbane Showgrounds. It was originally called the Brisbane Exhibition, but it is more commonly known as the "Ekka", short for "exhibition". It is run by The Royal National Agricultural and Industrial Association of Queensland. The Old Museum Building is a heritage-listed former exhibition building, former museum and now performance venue in Bowen Hills, Brisbane, Queensland, Australia. Weis is an Australian brand, owned by Unilever that produces frozen ice confectionery and frozen fruit desserts. They are most well known for their bar shaped fruit ice creams known as Weis Bars. They are sold at most Australian milk bars and supermarkets and in boxes of eight mini bars or four regular-sized bars at most supermarkets. The Weis manufacturing plant is located in Toowoomba, Queensland. The Bunya Mountains are a distinctive set of peaks forming an isolated section of the Great Dividing Range in southern Queensland. The mountain range forms the northern edge of the Darling Downs in the locality also called Bunya Mountains near Bell and Dalby. The mountains are south of Kingaroy and just to the south west of Nanango. The range is the remains of a shield volcano which was built from numerous basalt lava flows about 23-24 million years ago. The Barron Falls is a steep tiered cascade waterfall on the Barron River located where the river descends from the Atherton Tablelands to the Cairns coastal plain, in Queensland, Australia. The Tree of Knowledge was a heritage-listed tree in Oak Street, Barcaldine, Barcaldine Region, Queensland, Australia, that was poisoned and killed in 2006. It was a 200-year-old Corymbia aparrerinja ghost gum. It was added to the Queensland Heritage Register on 21 October 1992. Wotif.com is a website that provides a reservation service for hotels in Australia and international destinations across the globe. It was set up in March 2000 by Graeme Wood in Brisbane, Australia. It has since established offices in Canada, Malaysia, New Zealand, Singapore and the United Kingdom. Wotif.com was listed on the Australian Stock Exchange on June 2, 2006, but unlisted when it was acquired by Expedia, Inc..
Q150 was the sesquicentenary of the Separation of Queensland from New South Wales in 1859. Separation established the Colony of Queensland which became the State of Queensland in 1901 as part of the Federation of Australia. Q150 was celebrated in 2009. The Yatala Pie Shop is an iconic pie shop in Yatala, City of Gold Coast, Queensland, Australia. In 2009 as part of the Q150 celebrations, the Yatala Pie Shop was announced as one of the Q150 Icons of Queensland for its role as a "location".